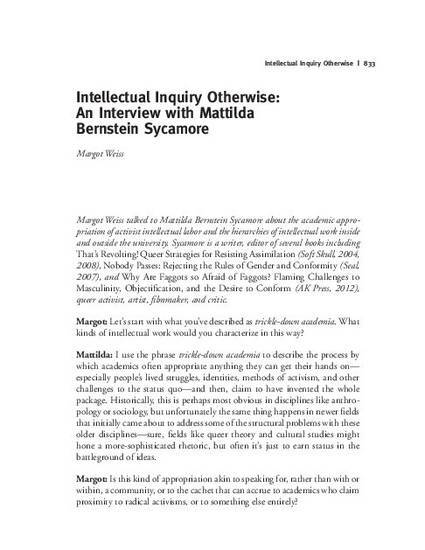 Margot Weiss talked to Mattilda Bernstein Sycamore about the academic appropriation of activist intellectual labor and the hierarchies of intellectual work inside and outside the university. Sycamore is a writer, editor of several books including That’s Revolting! Queer Strategies for Resisting Assimilation (Soft Skull, 2004, 2008), Nobody Passes: Rejecting the Rules of Gender and Conformity (Seal, 2007), and Why Are Faggots so Afraid of Faggots? Flaming Challenges to Masculinity, Objectification, and the Desire to Conform (AK Press, 2012), queer activist, artist, filmmaker, and critic.